The AT 7 is a British tier 7 tank destroyer. Conceived as an assault breakthrough tank, this design was completed by June 10th, 1943. No complete prototypes were built. 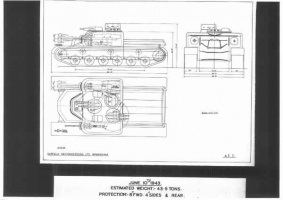 However, some parts and components of the AT7 were used in the A39 Tortoise. The AT 7 is a vast improvement over its predecessor, the AT 8. 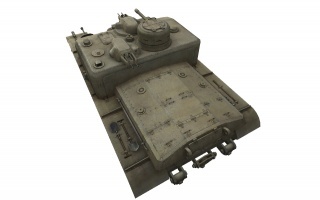 Although it still keeps the 203mm thickness of armor from the Tier 5, only the upper half is at a poor angle. The most notable feature of the AT 7 is the far right side-mounted gun. If the AT 7 manages to peek only the side-mounted gun around a corner, anything down that street will have a very hard time penetrating it while receiving generous amounts of damage. The AT 7 boasts very high penetration, great damage per minute, extreme accuracy, and a great aiming speed. The AT 7 leads to the AT 15. - Poorly angled upper armour. - Low profile and side-mounted gun makes it very vulnerable from facehugging. 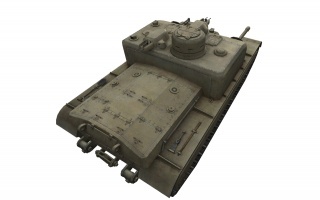 - 203mm of armour is not enough to withstand gold shells from most tier 7 enemies. - Horrible stock grind if coming from the Churchill GC. Very low top speed and poor turning speed. The AT 7 is a great tank for its tier. It has an excellent gun mounted to the far right of the tank, just above the track. This side-mounted gun opens up many advantages and disadvantages. If the AT 7 manages to peek out its gun from a corner, anything down that street will have a very hard time penetrating it. However, the AT 7 has a very poor gun arc and thus, cannot angle its armour. One should never face hug in an AT 7. Firstly, the large commander's cupola will ensure a quick death. Secondly, the side-mounted gun will be unable to aim at the front of the enemy, just the steeply-angled side. The 20-pdr gun is exceptional for its tier. It's very accurate, aims quickly, boasts good damage per minute, and has very high penetration. A gun laying drive is not necessary with this gun. The stock gun if coming from the Churchill GC is the 6-pounder. Yes, that gun you can get on the tier 3 Valentine TD. While it's now a 10-round autoloader, it has little value other than comedy as it more or less requires APCR spam to pen anything in tier 7-9. Even worse, all upgraded guns are too heavy for the stock suspension. Free XP or simply coming from the AT 8 instead is very strongly recommended. 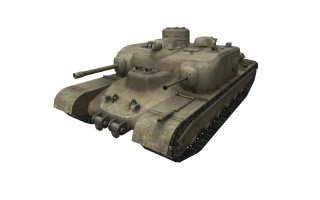 As with most British tank destroyers, the AT 7 has a very low top speed, poor engine power, and a slow traverse speed. It is a prime target for artillery due to its low speed and large size. An AT 7 should always keep moving forward to compensate for its low speed. The At 7 has potential sniping due to its accurate gun and good armour, but its poor view range hinders this. The AT 7 needs to be played with support from its teammates. Take the front-lines but don't get overconfident in its armour. Shots on the less-angled parts of the armour will most likely penetrate. Getting too close to the enemy will allow them to quickly destroy you through the big commander's cupola, although there are two machine gun blocks that protect some of it. You have a reasonable camouflage value despite being a heavily armoured brick, so don't be afraid to play as a long range sniper when in higher tier matches where your armour cannot be counted on. The AT 7 is a great improvement over its predecessor and can dominate in urban maps with the usage of its side-mounted gun. This gun is also exceptional in all aspects. An AT 7 played with support from its team can lead and protect its team while it slowly turtles towards the enemy forces. Taller friendly heavies can even fire over it while pushing it along as portable cover, although the low top speed limits the effectiveness of pushing. If you came instead from the Churchill Gun Carrier, only the WS No. 19 Mk. III Radio carries over and can be mounted immediately. If you came from the AT 8, the Nuffield Liberty Mk. V Engine, and WS No. 19 Mk. III Radio carry over. Mount them immediately as they have the same weight as the stock equipment. The OQF 77 mm AT Gun Mk. 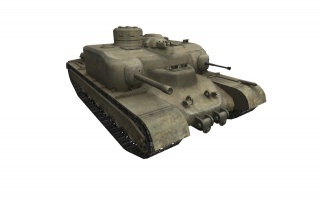 II can be mounted as soon as it researched. The OQF 17-pdr AT Gun Mk. VII can also be mounted right away, but will prevent you from mounting more than 100 kg of equipment (Binoculars, Tool box, Improved Ventilation and so forth). To rid yourself of these limitations, you will then have to research the AT 7 Mk. II Suspension, to allow for the weight of the upgrades. If not already researched, Nuffield Liberty Mk. V Engine comes next. Research the Ford GAA Engine. Now, research the OQF 20-pdr AT Gun Type A Barrel. Finally, research the WS No. 22 Radio. AT-7 was one of the proposed designs in the process that emerged A39 Tortoise. It had a 6 pounder as a main weapon which was at the time considered sufficient. Basically, it was a re-worked version of the AT-6 design from May 1943, in which the developers decided to put a 6pdr gun in a sponson mount, with the addition of several machine guns in separate mini-turrets. Several variations of the designs was considered, one of which included additional 20 mm auto cannon in the left sponson. Final design draft emerged a vehicle that had a maximum armour thickness of 203 mm on the front, with and 100 mm on the sides and rear. Total mass of the vehicle was calculated to be around 43,5 metric tons. There was also project designated as AT-7A, slightly lighter vehicle with a proposed mass of 41,5 tons. The AT 7's only intended armament was the 6-pdr gun. All other primary armament configurations are fictitious. No historical records of its performance specifications exist. This page was last modified on 10 April 2018, at 14:53. This page has been accessed 232,326 times.